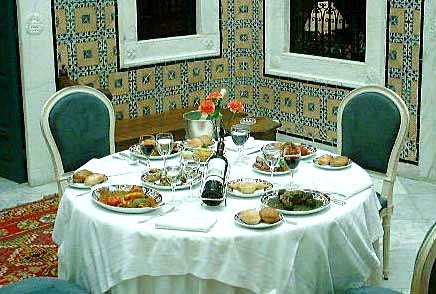 The Dar El Jeld is an upscale restaurant located in the Tunis medina. Back in history, it used to be known as a place where alumni of Sadiki college (established in 1875) used to meet. The place was also named after prince Rachid Bey, who was from a long line of Beys prior to Tunisia's independence in 1956. All history aside, you will find the Dar El Jeld to be a jem of a restaurant, with meat specialties such as lamb couscous, stuffed lamb shoulder, olive beef stew and spinach lamb. Their fish specialties include oven cooked fish, fish couscous, stuffed fish and fish pie. They offer six different menus with set prices from $31.42 - $66.77 USD (definately spendy). Some of the entrees featured in the menus include soup or salad, meat or fish specialties, shrimp skewers, assorted hors d'uvres, cream pastries, fruits in season and coffee. As you dine in the sumptuous surroundings accompanied with the soft enchanting melodies of traditional Tunisian music, you will realize why this restaurant ranks among the best in all of Tunis. They offer a wide assortment of red, white and rosé wine to accompany your meal. Their pastry list is long some of which consist of stuffed quinces, Turkish delight, fingers (phyllo dough stuffed) with dates and pistachios, or dates and hazelnuts, baklava (phyllo dough layered with butter and water honey syrup). They are open every day except Sunday for lunch and dinner. They're closed in July and August, as well as during Ramadan (October 14-15 - November 26-28, 2004).